Which robot do you have? The article you see here applies only to the Swivl C Series Robot. Click here for the Swivl Gen 2 Robot article. 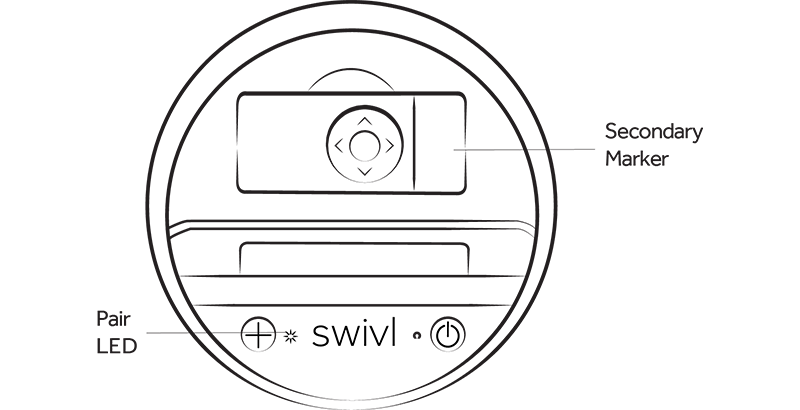 The marker that originally comes inside the Swivl Robot’s charging dock will be the Primary Marker, the only marker that Swivl tracks. The Primary Marker arrives pre-paired to the robot, so no pairing process is necessary, but if you do need to re-pair it to a different base, you can also use these instructions. Secondary Markers must be paired, and although they are identical to the Primary marker marker in appearance, their only function is to capture audio when they are added to your recording session. Setup Swivl with your mobile device. Go to the Settings menu on the Swivl app and then turn on the Primary marker. If it is properly paired when it is turned on, it will appear here. Remove packaging on the marker you wish to pair, and dock it in the Swivl base. Make sure the pins in the marker are lined up with the pins in the Swivl base. The pair LED on the robot base will blink multiple times to indicate pairing is in progress. Wait for the LED to stop blinking and become a solid light, then remove the secondary marker from the dock and turn it on. At this point, the Swivl app will prompt you to select a color for the marker. Apply a sticker dot with the same color on the marker. Tap done in the app. Similar to the Primary marker, when a secondary marker is successfully paired and turned on, it will appear in your Settings menu. Repeat these steps for all additional markers you would like to pair to your unit (up to five total markers per robot, including the Primary marker). Using multiple markers allows you to capture multiple tracks of audio, which you can then listen to separately on Swivl cloud. To learn more about listening to the separate Swivl C Series audio tracks, click here.